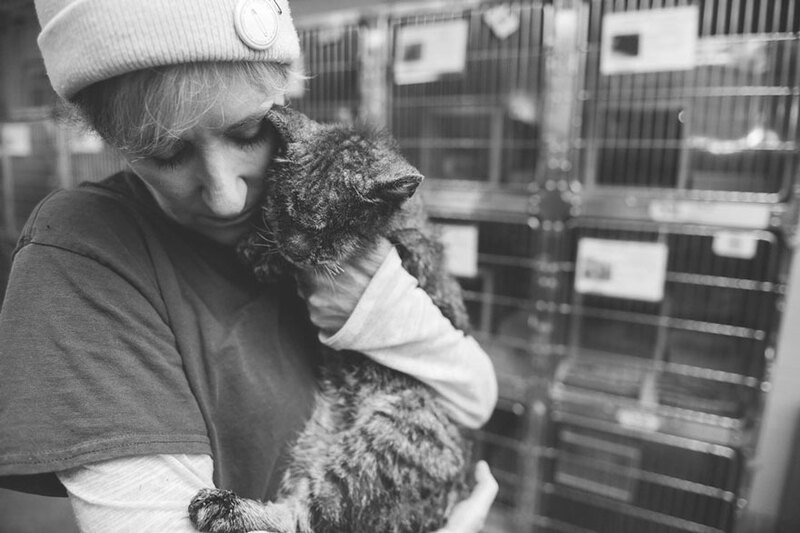 Valentino the cat wanted nothing more than for someone to give him some love. Sadly, his looks and condition prohibited just that. 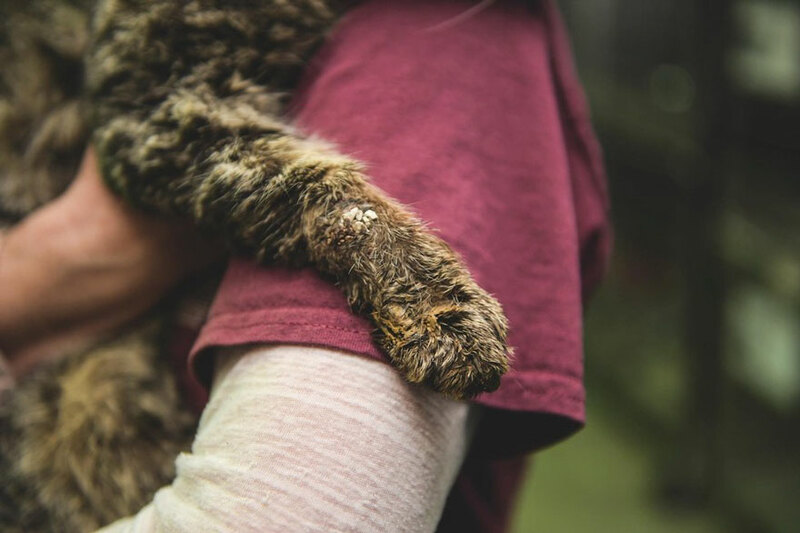 The cat's hardened fur was riddled with grime. His eyes were so caked and swollen, they were sealed shut. 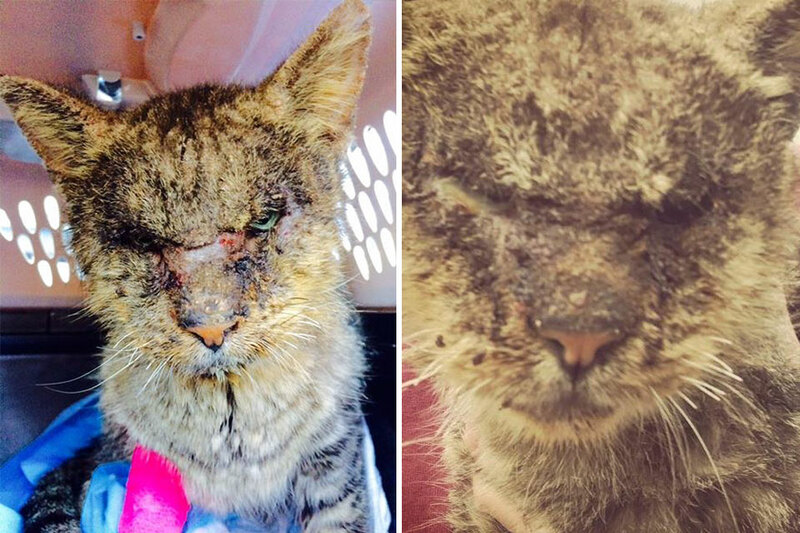 Even worse, this poor cat suffered from sarcoptic mange, a condition that's highly contagious to both cats and humans. 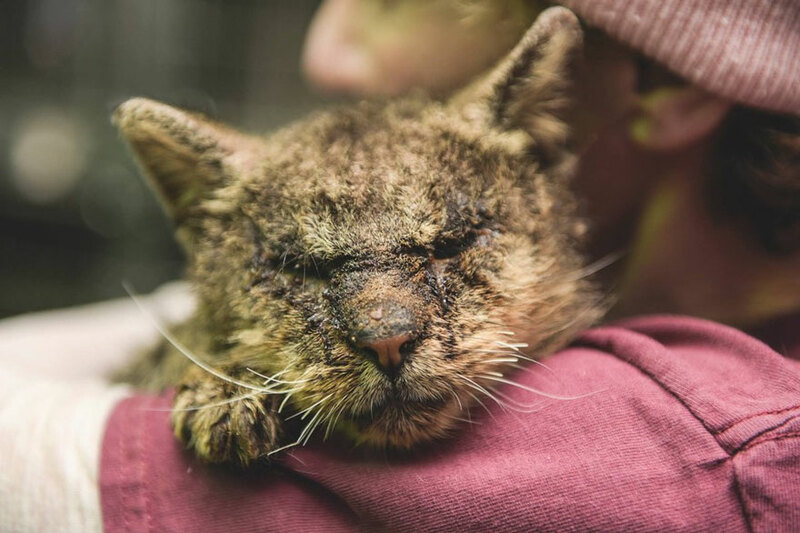 So Valentino was left alone… begging for love, but people were too afraid to go near him. Except for a woman named Elaine Seamans. 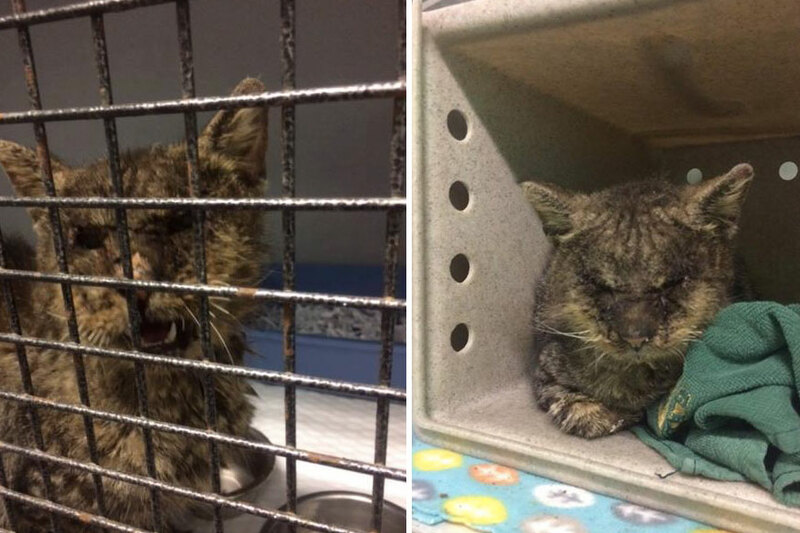 While passing by his cage at the Baldwin Park animal shelter last week, she heard his faint cry for help. "He reached out with his little paw and made the tiniest meow," Seamans tells The Dodo. "It was like he was screaming without verbalizing it: 'Please help me.'" "There are times when it's not an option to keep walking," she adds. "You just have to stop. This was one of those times." And she opted not to wear gloves, but to press Valentino directly to her heart. "When I picked him up, he put his little head on my shoulder," Seamans says. "That was it. I had to get him out." "When I was talking to Elaine on the phone and she let me hear his little meow, I said, 'That's it,'" she tells The Dodo. "I could hear him. That sealed the deal." 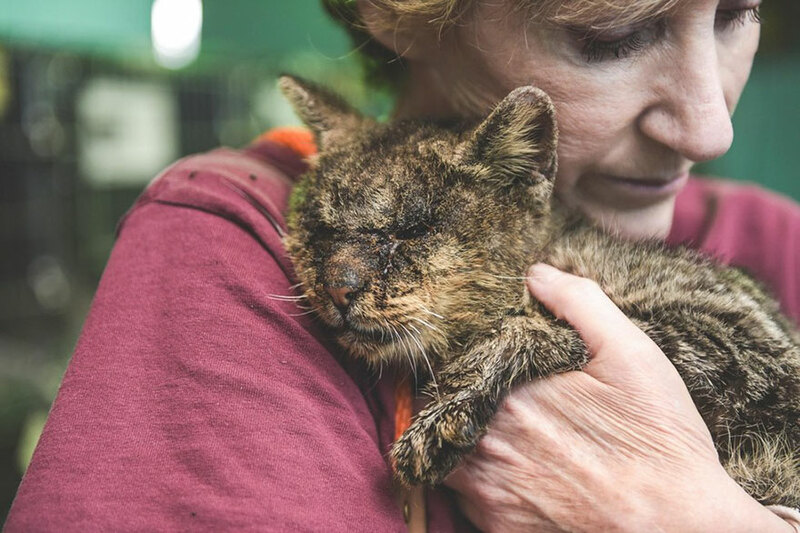 Wisneski immediately took Valentino to the vet to get the medical attention he needed. His prognosis is good, and staff believe he has a long life ahead of him. They can’t wait to find him a loving home that he so deserves. "He's so loving," Wisneski says. "You can tell he is very grateful. He will purr for them and try to rub up against [veterinary staff]. He knows he is safe." When Valentino finally opens his eyes, it will be to a brand-new life. One with a family. You can follow Valentino’s recovery on Facebook. If you’d like to help, you consider leaving a donation here. Even better, if you’re interesting in giving Valentino a loving home, you can get in touch with him here. 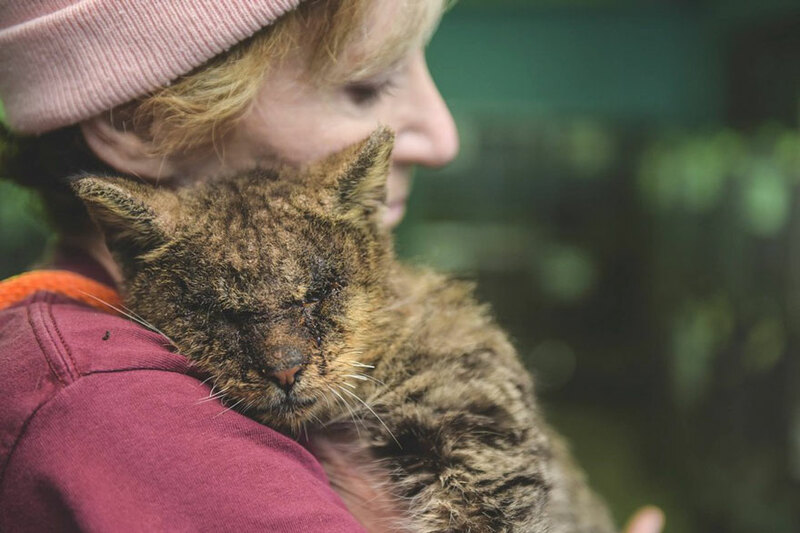 Kitty covered with thick matted fur couldn't stop purring when her rescuers shaved it off!